The discovery of CRISPR-Cas9 has made gene editing very easy. Unfortunately, the molecular tool has recently been found to be less precise than previously assumed. It can lead to unwanted mutations in a cell's DNA. Researchers at Delft University of Technology have now identified a mechanism that causes such mutations when CRISPR-Cas9 is used incorrectly. This can cause dormant genes to become expressed, which is potentially very dangerous. The researchers have created a checklist based on their findings. Using this checklist will prevent the harmful mechanism from being activated and makes gene editing using CRISPR-Cas9 safer. Like those of many organisms, human cells contain two copies of each chromosome: one from each parent. These chromosome copies are almost identical, but they contain small differences in a number of genes. The small variations lead to the genetic differences between individuals. Having a backup for every chromosome may sound like a good thing. 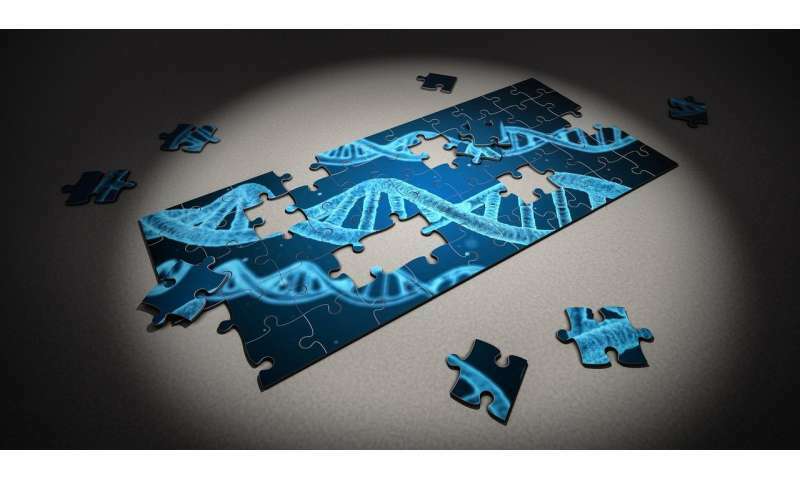 However, researchers of Delft University of Technology have found that it can cause problems in combination with the gene editing tool CRISPR-Cas9. "When CRISPR-Cas9 is used to target a single chromosome in heterozygous organisms such as humans, a natural repair mechanism is activated. ", said researcher Dr. Jean-Marc Daran. "It turns out that this mechanism uses the other copy of the chromosome as a template for repairing its DNA." Normally, gene editing experts using CRISPR-Cas9 can change part of the genome of a cell by introducing a new sequence of DNA. The Cas protein cuts open the DNA at a targeted spot, after which the cell is expected to repair its DNA using this new string of genetic material. Thus, new genes can be introduced. "Of course, when the repair mechanism uses the other chromosome as a template instead of the newly introduced string of DNA, the editing will not be successful", said Daran. Since repair using the other chromosome is far more efficient, repair using the intended DNA fragment almost never occurs. Worse than that, loss of heterozygosity can occur, which can have serious health consequences. Diseased genes that were dormant may become expressed, for instance genes that can cause cancer. This discovery of the repair mechanism that blocks gene editing was accidental, as is often the case in science. Arthur Gorter de Vries, a Ph.D. candidate at Delft University of Technology, was working on research involving brewer's yeast. He tried to determine how domestication of brewer's yeast ultimately led to the modern strains of yeast that beer producers now use. "I was trying to remove a certain gene in order to determine its function. ", Gorter de Vries said. "Strangely, I could not confirm that I had successfully removed the gene. I also noticed that the cells were behaving erratically." Gorter de Vries was targeting only one of the chromosomes in his yeast. Further experiments proved that the yeast cells were using the other copy of the targeted chromosome as a template to repair the DNA that he had been trying to remove. While this newly discovered mechanism can prevent gene editing from being successful and can even lead to harmful mutations, this only happens in organism that are heterozygous. "More importantly, the repair mechanism only becomes active if just one chromosome is targeted for editing and not both", said Daran. There are some other factors that need to be taken into account, which is why the researchers have created guidelines to safely edit DNA in heterozygous organisms. The results of their research, including the guidelines, have been published in Nucleic Acids Research.